VMware agreed to acquire Virsto Software, a start-up offering software for optimizing storage performance and utilization in virtual environments. Financial terms were not disclosed. Virsto, which was founded in 2007 and is based in Sunnyvale, California, developed a storage hypervisor that does for storage what the server hypervisor did for servers. Virsto’s storage hypervisor delivers high performance, space efficient virtual storage at the individual VM level, serving up advanced per-VM data services from any existing block-based storage device, from JBOD to SSD. Virsto is backed by Canaan Partners, August Capital, InterWest Partners, Southern Cross Venture Partners and Correlation Ventures. VMware said its strategy is to extend the benefits of virtualization to every domain in the datacenter – compute, network, storage and the associated security and availability services. Virsto will expand VMware’s storage portfolio, which includes the storage virtualization and management capabilities of VMware vSphere and the VMware vSphere Storage Appliance. In addition, EMC plans to license the Virsto technology, extending the cooperative efforts between the two companies in storage architectures. 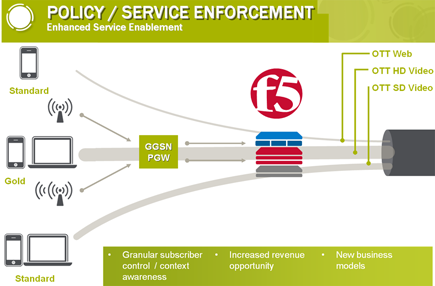 F5 Networks is adding policy enforcement capabilities to its BIG-IP traffic steering and load balancing platform, allowing service providers to convert the BIG-IP's deep visibility into network conditions and subscriber behavior into optimized services. F5's new BIF-IP Policy Enforcement Manager (PEM) software can classify traffic and enforce policy based on applications and subscriber behavior. BIG-IP PEM also provides granular reports on subscriber and application flows, and it integrates with online charging subsystems, giving operators real-time credit control. The software is interoperable with third-party Policy and Charging Rules Function (PCRF) vendors and is compliant with the latest 3GPP standards for a Policy and Charging Enforcement Function (PCEF). BIG-IP PEM is designed to run on VIPRION, F5’s high-performance, chassis-based hardware platform. When run on F5’s latest VIPRION C4800 offering, BIG-IP PEM enables service providers to achieve up to 320 gigabits per second L7 throughput, support up to 72 million concurrent connections, and serve as many as 96 million subscribers on a single device. F5 said its Policy Enforcement Manager also provides the ability to provision and de-provision value-added servers based on real-time subscriber and network traffic conditions. The BIG-IP PEM adds to the F5’s intelligent services framework. Other recent enhancements to the platform include BIG-IP Carrier-Grade NAT and BIG-IP Advanced Firewall Manager. All of these capabilities are now available. The GENBAND NUViA, which is powered by the company’s EXPERiUS solutions, is a secure multimedia communications cloud service that essentially enables service providers to accelerate their entrance into RCS without the upfront costs. The NUViA Unified Communications as a Service (UCaaS) includes HD voice, video, multimedia messaging, mobility, conferencing, Web collaboration, desktop clients, and fixed and mobile convergence. GENBAND will also offer a "build, transfer, own" model that ensures a low-risk, low-barrier to entry and quick path to RCS. "NUViA offers service providers a radically different model for deploying communications services from what is available today,‖ said Jeff Townley, President of GENBAND’s Services Business Unit & Global Operations. ―Service providers and channel partners can leverage NUViA’s unprecedented deployment options, including hybrid models with the ability to augment the NUViA-delivered services with in-house applications, to deliver customers a unique, customized and cost-effective alternative to services derived from premises-based equipment." 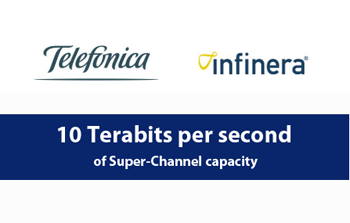 Telefónica and Infinera announced a joint Terabit Technology Showcase that demonstrated 10 Terabits per second (Tbps) of optical super-channel capacity. 10 Tbps of super-channel capacity based on Infinera FlexCoherent technology to realize QPSK and 16 QAM super-channels to extend fiber capacity and signal reach. Telefónica I+D’s Flexi-Grid standards based GMPLS control plane for rapid service deployment and simplification of network operations. Demonstration of Infinera’s next-generation PIC-based flexible grid super-channels for improved spectral efficiency and flexibility. Infinera said the demonstration illustrates some of the potential future capabilities of its PIC based Digital Optical Network solution, including transmitting ten 1 Tbps super-channels as well as a demonstration of flexible grid transmission. "Infinera’s 10 Terabit super-channel transmission and flexible grid transmission have been successfully tested in Telefónica I+D labs,” said Juan Fernandez-Palacios, Head of Core Network Evolution at Telefónica I+D-GCTO Unit. "This demonstration shows a promising path to higher capacity and cost effective optical transmission beyond 100Gbps." The companies also showed rapid deployment of services, robust protection and ease-of-use with Telefónica’s prototype Flexi-Grid GMPLS control plane. Radisys and Airspan announced the development of the world’s first commercial LTE-Advanced (LTE-A) small cell solution. 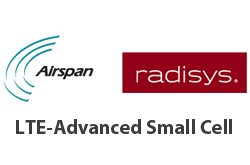 Airspan’s LTE-A capable AirSynergy 4G leverages Radisys’ Trillium TOTALeNodeB small cell software, which has been enhanced to include key LTE-A features. AirSynergy 4G is an all-in-one compact outdoor Pico Base Station supporting LTE-Advanced. Radisys and Airspan augmented TOTALeNodeB with key LTE-A features including soft-frequency re-use via distributed eICIC, Almost Blanking Subframe and range extension. Radisys’ Trillium TOTALeNodeB software includes the necessary Radio Resource Management (RRM), Self-Organizing Network (SON) and Operations and Maintenance (O&M) functionality required for rapid deployment, and is built on top of the proven Trillium LTE protocol stacks. "Radisys is our long-time, trusted partner as we’ve leveraged the company’s Trillium software and professional services for our small cell and macrocell products,” said Paul Senior, CTO, Airspan. “Collaborating on the first LTE-Advanced small cell solution is a natural extension of this partnership. Leveraging Trillium TOTALeNodeB for AirSynergy 4G accelerates our ability to be first to market." "Our Trillium TOTALeNodeB solution has won many industry awards, but our professional services team is just as critical in enabling Airspan’s rapid market entry,” said Manish Singh, CTO, Radisys. “Our highly skilled team works with Airspan on feature customization and platform integration and verification, ensuring state-of-the-art technology solutions. We’re excited to partner with Airspan on the first commercial LTE-A small cell solution." Procera Networks has licensed its Network Application Visibility Library (NAVL) Deep Packet Inspection (DPI) engine to a large telecommunications equipment manufacturing (TEM) company. The solution provides comprehensive application classification to enhance monitoring and testing applications. Procera expects to recognize the revenue from this contract over the next three years. The DPI engine provides real-time, Layer-7 classification of all network application traffic. Delivered as a software developer kit (SDK) and designed for quick integration into Enterprise and Telecommunication network infrastructure platforms, NAVL provides the application visibility and intelligence that enable developers of firewalls, unified threat management (UTM) and other network security and management solutions to apply and enforce application admission, control and performance policies for their enterprise and service provider customers. 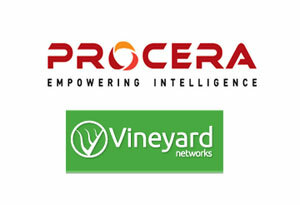 Procera’s NAVL DPI engine and OEM products are the result of its recent acquisition of Vineyard Networks. "This implementation has the potential to be one of many with this TEM. We are pleased to continue our success providing solutions to telecommunications equipment manufacturers," said Jason Richards, senior vice president of Business Development at Procera. “We see a growing demand for Intelligence Everywhere, and network operators are looking for DPI solutions that enable them to have greater visibility and control of their networks." The Wireless Packet Core Equipment market is forecast to nearly double in size, exceeding $6 billion by 2017, according to a new report from Dell'Oro Group. Evolved Packet Core, the emerging segment of this market, is forecast to expand to over half of the total market, driven by the Long Term Evolution (LTE) network capital spending. During the forecast period, Dell'Oro expects new vendors to enter the Wireless Packet Core market, leveraging their strengths in adjacent markets. The report also shows that the PCRF market is forecast to exceed $800 million in 2017. "In addition to escalating use of smartphones and surging wireless data usage, we expect that new wireless packet core devices will incorporate features to address deep packet inspection (DPI) and WiFi management," said Chris DePuy, Vice President at Dell'Oro Group. "As Service Providers expand the capabilities of their core networks in order to roll out additional services and manage users across both cellular and WiFi networks, we expect the market to experience robust growth." Broadcom announced a 28nm 4G LTE modem with integrated radio and cellular baseband reduces board area by approximately 35 percent while supporting LTE-Advanced with carrier aggregation, HSPA+, TD-SCDMA and EDGE/GSM. Broadcom's multi-mode, multi-band solution – the BCM21892 – is aimed at next generation 4G LTE smartphones and tablets. The device combines a full-featured cellular baseband with a world-band radio that can support virtually any designated 3GPP LTE frequency band and combination, which aids in 4G LTE roaming. The LTE-Advanced capability will support LTE Category 4 speeds of 150 Mbps with seamless hand-offs between the various 4G LTE, 3G and 2G interface technologies. A Voice over LTE (VoLTE) solution that enables high-definition voice calls. Broadcom estimates its VoLTE service consumes approximately 40 percent less power than a comparable WCDMA voice call. Significantly, Broadcom said its design employs advanced power management techniques that can save up to 25 percent of the power typically consumed during data transmissions to the network. President Obama signed an executive order aimed at countering cyber security threats with better information sharing and coordination between U.S. government agencies and the owners and operators of critical infrastructure across the country. In his State of the Union speech, Obama said the United States faces real threats to its infrastructure and economy and he called on Congress to give the government more authority to secure networks and deter attacks. Some key elements of the new directive. New information sharing programs to provide both classified and unclassified threat and attack information to U.S. companies. The Executive Order requires Federal agencies to produce unclassified reports of threats to U.S. companies and requires the reports to be shared in a timely manner. The Order also expands the Enhanced Cybersecurity Services program, enabling near real time sharing of cyber threat information to assist participating critical infrastructure companies in their cyber protection efforts. The development of a Cybersecurity Framework. The Executive Order directs the National Institute of Standards and Technology (NIST) to lead the development of a framework of cybersecurity practices to reduce cyber risks to critical infrastructure. NIST will work collaboratively with industry to develop the framework, relying on existing international standards, practices, and procedures that have proven to be effective. To enable technical innovation, the Cybersecurity Framework will provide guidance that is technology neutral and that enables critical infrastructure sectors to benefit from a competitive market for products and services. The directive defines the term critical infrastructure as "systems and assets, whether physical or virtual, so vital to the United States that the incapacity or destruction of such systems and assets would have a debilitating impact on security, national economic security, national public health or safety, or any combination of those matters." The White House also ordered Federal agencies to incorporate privacy and civil liberties safeguards in their activities, including safeguards based upon the Fair Information Practice Principles (FIPPS) and other applicable privacy and civil liberties policies, principles, and frameworks. The Obama administrations also plans to set-up a voluntary program to promote the adoption of the Cybersecurity Framework. Ruckus Wireless reported Q4 revenue of $62.2 million, up 51% compared to $41.0 million reported in the fourth quarter of 2011. GAAP net income was $1.9 million, compared with a net income of $3.2 million in the fourth quarter of 2011. GAAP net income per diluted share was $0.03 for the fourth quarter of 2012 compared to $0.02 for the fourth quarter of 2011. 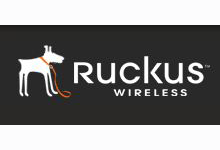 "2012 was an exciting year for Ruckus Wireless. In addition to completing our IPO, we continued to make progress on our business objectives while growing our revenue 79% and significantly increasing profitability over the prior year," said, Selina Lo, President and Chief Executive Officer at Ruckus Wireless. NETGEAR reported Q4 2012 revenue of $310.4 million, as compared to $309.2 million for the fourth quarter ended December 31, 2011, and $315.2 million in the third quarter ended September 30, 2012. Net income, computed in accordance with GAAP, for the fourth quarter of 2012 was $16.1 million, or $0.41 per diluted share. This compared to GAAP net income of $22.8 million, or $0.60 per diluted share, for the fourth quarter of 2011, and GAAP net income of $23.8 million, or 0.61 per diluted share, in the third quarter of 2012. "The worldwide macroeconomic environment proved challenging for us during the second half of 2012. In the fourth quarter, we witnessed reduced spending among our service provider customers and Commercial Business Unit customers. Despite this, our Retail Business Unit experienced the best fourth quarter sequential growth in the last three years. We are very pleased with the share gain against our retail competitors worldwide. We introduced 32 new products in the fourth quarter of 2012 and once again, we were a double honoree this year in the CES Innovations Design and Engineering Awards competition," stated Patrick Lo, Chairman and Chief Executive Officer of NETGEAR. Level 3 Communications Q4 2012 revenue of $1.614 billion, compared to $1.590 billion for the third quarter 2012 and $1.579 billion for the fourth quarter 2011. For the full year 2012, total revenue was $6.376 billion, compared to $6.318 billion pro forma for the full year 2011. There was a Q4 net loss of $0.16 per share, excluding a loss on the extinguishment of debt of $0.23 per share and a benefit from special items recognized in the fourth quarter 2012 of $0.13 per share. Core Network Services (CNS) revenue grew sequentially to $1.424 billion in the fourth quarter 2012, increasing approximately 1.8 percent on a constant currency basis. "In 2012, we took a deliberate and careful approach in bringing Global Crossing and Level 3 together to ensure we maintained the excellent customer service capabilities we've worked hard to build over the last several years," said Jeff Storey, President and COO of Level 3. "We completed several milestones in support of a unified customer experience in 2012, and our customer satisfaction scores improved over the course of last year." "With the progress we made throughout the year and the additional milestones we reached in the fourth quarter, we felt comfortable taking additional cost reduction actions in the fourth quarter, reducing our workforce by approximately 4 percent and beginning the process to exit office locations. At the same time, we made investments for growth by increasing our sales force, putting additional customer buildings on-net throughout our global footprint, and launching additional capabilities to our Managed Services, Managed Security and Professional Services product offerings." "As we look to 2013, we remain focused on revenue growth in all regions, and continuing to drive additional cost efficiencies throughout the business."